What if the “river” is the Holy Spirit, and what if the “city of God” is you and I? If we take Psalm 46:4-5 out of the box and see how personal it can be it then becomes a powerful illustration of the “inner workings” of an intimate relationship with God. Think about this for a moment and allow it to sink in, “God is within YOU; YOU will not be toppled”. Each time I see a news report of hurricanes striking parts of Florida I am amazed at how the palm trees can bend with the high winds and not break or be uprooted. With God in YOU hurricane force winds may bend YOU but there’ll be no breaking. Don’t take my word for it look in the rear view mirror of your memories. “God will help YOU when the morning dawns.” I believe there is a point in all of us when it becomes decision time. Will I trust myself and my own abiliities, will I trust other worldly resources, or will I trust God? Those are not one time decisions either, we make them on a daily basis, sometimes on an hourly basis. Do you know what it takes to trust God? 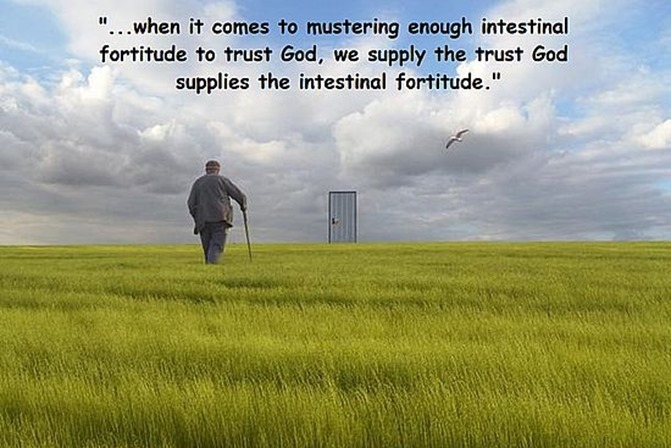 Make no mistake trusting God takes “Guts,” it takes “intestinal fortitude” to rely on God. After a difficulty or adversity has passed have you ever look back and said to yourself, “How did I ever make it through that?” You and I both know the answer don’t we? We have first hand knowledge, we know when it comes to mustering up enough intestinal fortitude to trust God, we supply the trust God supplies the intestinal fortitude.